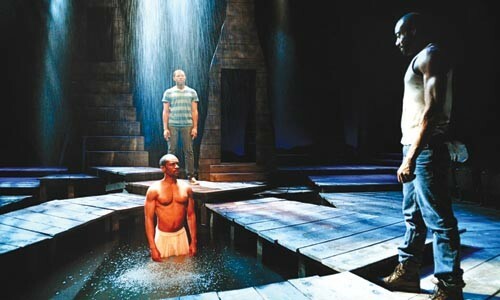 Rain date: (from left) Jaime Lincoln Smith, Larry Powell and Maurice McCrae in City Theatre's Marcus. That's my critique, if City Theatre is looking for something to run in an ad for its production of Marcus; or The Secret of Sweet, by Tarell Alvin McCraney. 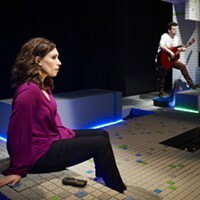 It is a lovely play; gentle and sentimental with just the right amount of bitter notes to offset the sweetness. Marcus is a young gay man living in Louisiana, suddenly struggling with the decision to come out to his best girlfriends, Shaunta and Osha, and his exceedingly dour mother, Oba. Marcus has been brought to this threshold because of the recent death of his father, who may or may not have been at least gay-ish himself. Underneath McCraney's considerable flair for theatricality, Marcus is a tender coming-of-age story, and the playwright has done a remarkable job capturing the small hidden moments and occasions for grand passion constantly battering a sexually awakening young man. Marcus is also the third part of a trilogy by McCraney. 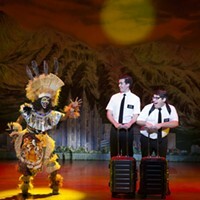 The middle play, The Brothers Size, played at City Theatre last year. You certainly don't have to have seen that one (which I didn't) to enjoy this one (which I did). But knowing that McCraney has created two additional tales helps explain why you sometimes feel as if other worlds are intruding on this one. There's a few subplots and extraneous characters that occasionally stop the dramatic flow, and it must be said that the climax of Marcus really has nothing to do with the play we've been watching; it seems to be resolving some element in one of the other plays. But -- and I can't stress this enough -- it hardly matters. This production, with moving, expressive direction by Robert O'Hara, is just a chance to bask in the beauty of McRaney's words and, especially, his characters. I can't remember the last time I saw a play so rich with such riveting and finely wrought people. And as played here with the ferocious power and aching depth of Starla Benford, Jocelyn Bioh, Maurice McRae, Jaime Lincoln Smith, Bria Walker and especially Larry Powell in the title role ... well, it doesn't get any more lovely. Marcus; The Secret of Sweet continues through Feb. 13. City Theatre, 1300 Bingham St., South Side. 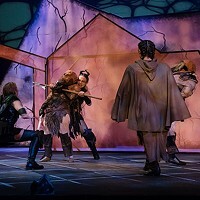 412-431-2489 or www.citytheatercompany.org.